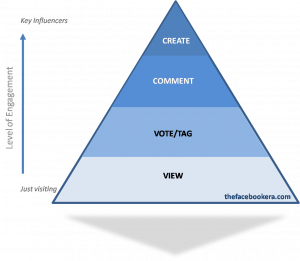 When it comes to social media ROI, everyone keeps talking about correlating votes and comments to sales. Totally important, I agree. And especially challenging when you are talking about most products and services, which are sold offline. That we’ll discuss in a future blog post. For now, there are (at least) two additional aspects of ROI that are really important but not ever talked about. First, social ROI. The value of someone engaging actively on your online community has spillover effects on everyone else in the community as well as that individual’s broader network (especially when social network hooks like Facebook Connect broadcast the person’s activity back to their friends on Facebook). Second is innovation ROI. Just look at MyStarbucksIdea and Dell Ideastorm, two examples of community forums which crowdsource ideation and feedback from customers. The company seeds the site with ideas for new products and features, and the community responds by voting ideas up or down, commenting, and even suggesting their own ideas. For FREE, customers help Starbucks and Dell come up with new ideas and prioritize where they should be investing. For example, as a result of a community idea, Dell started shipping hardware with Linux operating systems which has resulted in real revenue, not only from the person who came up with the idea and the people who voted on Ideastorm, but across the market and from attracting new customers. * Obviously a very rough approximation, assumes there is little to no overlap between the individual’s network and the vendor community. Sales resulting from idea contribution can be defined as total revenue (or incremental increase in revenue) resulting from new products or features suggested by the community, divided by the number of participants in the community. It’s interesting to think about the subliminal effects of naming - for example, a Facebook friend versus a Linkedin connection. Even if it’s the same person, we tend to be in a different mode of interaction with him or her depending on the site. Do we project “friendship” with our Facebook contacts, at least for the duration of interaction on the Facebook site? A common complaint about social media is that it’s hard to measure success. But the reality is not a lack of metrics but rather there being too many things we can measure. Social media comes in such a diversity of forms and uses cases that the challenge modern marketers face is how to select the right metrics, which is different for every business. It is all too easy to become overwhelmed by the “tyranny of too much data,” and either waste time trying to track too many metrics or the wrong metrics - not to mention the scalability issues that crop up with large data volumes when you are trying to capture and slice-and-dice every little action that every user performs. In a world where you can track just about everything, how do you focus on the right things? Ultimately, what are your organization’s goals for adopting social media? Customer satisfaction? Innovation? Branding? Sales? Upsell and cross-sell, or new customers? Which kind of site visitor metrics has the biggest correlation with the goals you identified: behavioral metrics (eg, spent X minutes on Y page, downloaded Z content), demographic metrics (eg, females in New York), social metrics (eg, several of this individual’s Facebook friends were also interested in this product). For example, maybe the number of votes and comments on a site have nothing to do with upsells but help drive customer sat. At the top of the pyramid are a small number of creators, including your most influential community members. They are your evangelists, most ardent fans, and passionate contributors of new ideas. Next are those who tend to comment on, though generally not contribute, ideas and discussion threads already put forth by others. These individuals are essential for creating a sense of dialogue across different members of the community, for helping to refine ideas and make them better. One step down are people who vote and tag items in your community. They express their preferences and opinions in the lowest-commitment way possible, but are still engaged. Last but not least are the bulk of your community visitors: people who are just visiting, consuming content but not participating per se. Online marketing managers need to understand what the pyramid looks like for their particular communities, how they can encourage people to become increasingly engaged over time, and how specifically each engagement level might lead to or be correlated with sales. For many of us, this might be a better, more nuanced way for linking our marketing funnel (as measured by online engagement in this case) and sales pipeline in the Facebook Era.